ReVision provides a remarkable eye exam experience by utilizing all the latest technologies. With every exam the retina of the eye plays an important role in diagnosing eye conditions that can lead to blindness if left uncorrected. Unfortunately, the need to dilate the pupils with eye drops can leave patients with disorienting, uncomfortable vision problems for hours following the procedure. Many patients have trouble with this old-fashioned method of dilating the eye using eye drops, causing light sensitivity and distorted vision that lasts well beyond the examination. Dilation helps reveal more of the retina, but it is difficult to see more than one small bit of it at a time. It can still be a challenge for optometrists to get a good view of the entire retina even with eye drops. Today, a technique called Digital Retinal Imaging makes the exam fast and easy for everyone involved. Digital retinal imaging uses high-resolution imaging systems to take pictures of the inside of your eye. This helps our eye doctors detect any eye and health conditions as glaucoma, diabetes, and macular degeneration. Retinal tears or detachments, a condition in which part of the retina tears away from the inner wall of the eye, causing “floaters” and other vision problems. Macular degeneration, a progressive disease, affecting a part of the retina known as the macula, that can cause your central field of vision to fail. Diabetic retinopathy, a swelling and blood vessel damage in the retina due to complications from diabetes. Retinitis pigmentosa, a disease of the photoreceptor cells that can affect your peripheral and night vision. Retinal exams are necessary for finding these and other disorders in time to treat them. Digital Retinal Imaging represents a great leap forward. 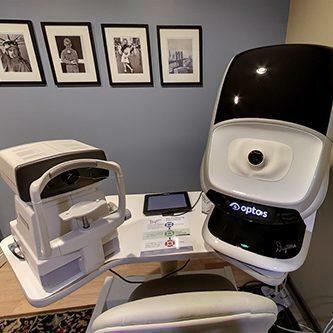 The process takes mere seconds, and all you have to do is stare into our advanced scanning device—no dilating eye drops necessary! Not only does this technology let us view the entire retina at a glance, but it also provides a photographic record of it for ongoing reference. While digital retinal imaging eliminates the need for dilating eye drops for the majority of patients, there are a few exceptions. If you’re having your eyes examined under Medicare, dilation is a requirement, as it is for those who are undergoing preliminary examinations for eye surgeries such as LASIK. Although dilation won’t be needed during your first scheduled exam, we may need to use dilation at your next scheduled visit if our eye doctors deem it necessary. Dilation must be done for patients with diseases like glaucoma and diabetes, yet are done in conjunction with wide-field imaging to document the state of the disease in the eyes. You can find out for sure whether you’re a candidate for Digital Retinal Imaging by contacting our clinic and arranging a consultation. We look forward to introducing you to a faster, easier kind of retinal exam!